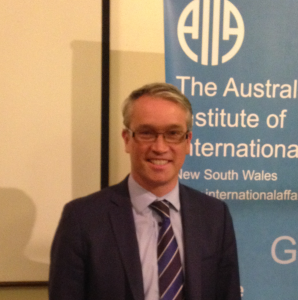 On Tuesday 10 April, Tom Switzer – executive director of the Centre for Independent Studies and presenter of ABC Radio National’s Between the Lines – addressed a capacity audience at Glover Cottages. He presented a minority, conservative, realist perspective on the prevailing hostile consensus on Russia and warned of the cataclysmic consequences of continuing down our present Russiaphobic foreign policy path. “Where all think alike, no one thinks much at all.” Tom Switzer began by highlighting the need to always question predominant opinion, a necessity in the increasingly one-sided and damning characterisation of Russia. In his view, since the end of the Cold War Russia has been progressively marginalised, contained and humiliated as America seeks to shape the world to its unipolar vision. Western countries have underestimated Russia’s strategic sensibilities and castigated and demonised Russia’s every move as an affront to the international rules-based order. Should this continue, the spectre of nuclear confrontation grows ever likelier. Tom drew attention to four current issues where Russia has been criticised for its actions: seizure of Crimea from Ukraine; intervention in Syria; supposed meddling in the US election; and the attempted Skripal assassinations. His main purpose was to rationalise and bring context to each of these actions. Concerning the annexation of Crimea and support for ethnic Russians in eastern Ukraine, Tom highlighted the strategic role of Crimea as home for the Russian Black Sea Fleet, and of Ukraine as the conduit for gas exports to Western markets and a buffer zone for Russia. If we adopt a geopolitical lens, it is evident that Putin’s actions are characteristic of all great powers: a desire to protect its vital national interests in its traditional sphere of influence. While the indiscriminate bombing in Syria by Russian fighters has been catastrophic, Tom again brought a realist lens to this affair, asserting that it is a better scenario than regime change: if Assad went down, the ensuing chaos would be bloodier, the ethnic minorities would face massacre and more refugees would be streaming through Turkey. If Iraq and Libya have taught us anything, it is that democracy is not an export. Furthermore, Putin feared that if Syria changed hands Russian naval ports on Syria’s western coast would be gone, and along with them Russia’s access to the Mediterranean. Regarding Russia’s possible meddling in the US election, Tom characterised this as a “So What” issue. It hasn’t been proven that the Russian trolls were hired by the Kremlin; even if they were, all the great nations have always conducted surveillance and interference into each other’s affairs. Examples such as Obama’s hacking of Angela Merkel’s phone abound. No evidence has arisen demonstrating collusion between the Trump campaign and Russian mischief-makers. But Trump has garnered such vitriolic anger from the Left that they are willing to delegitimise him at the cost of hurting the US’s national interest and further damaging US dealings with Russia. Similarly, there has been no actual evidence of Russian involvement in the attempted Skripal assassination. Governments have acted to expel Russia’s diplomats based on bombastic assertions. This illustrates the widespread Russiaphobia that has infected the political and media elites of the west. Although Russia is a declining superpower, it has substantial nuclear arms and if humiliated and made desperate it could be dangerous in the way that a cornered wounded animal is. What’s missing is perspective. Tom Switzer concluded by calling for us all to put ourselves in Russia’s shoes, and to look at the world from their standpoint. If we do, we may start to make sense of their actions, and be able to treat them with the respect and dignity they deserve. If not, we risk escalating this situation and creating the Cuban Missile Crisis of the 21st century.